Games are Team A vs Team B which each team comprised of 1-5 players (or more, idk). Each team has as their most precious asset a Dropship, snuggled within a base, with each base placed at opposite ends of a symmetric map. Victory condition is exclusively the destruction of the enemy dropship. Maps are symmetrical in nature, with each team's base and dropship located on opposite ends. The bases are connected by three open lanes, one in the center and two on the flanks of the map. Each lane will have several defensive turrets along its length, with each team controlling the turret on their half of the map. Each base will spawn waves of AI-controlled units (vehicles) that will follow these lanes towards the enemy base. The area between these lanes will be a maze-like quagmire of impassable terrain and much denser, LOS-limiting areas (the "jungle"). 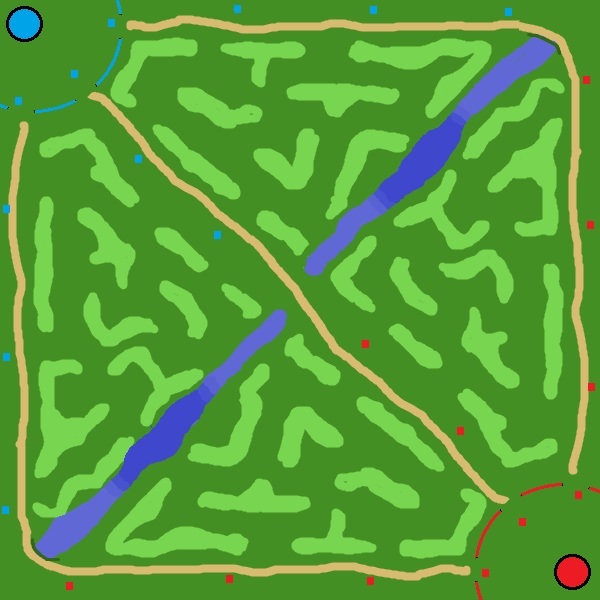 Populating this maze will be more powerful, neutral AI units as well as special objectives whose destruction or capture will provide certain bonuses for the team that destroys/captures it. A long lake or river will run opposite the two teams' bases, deeper towards the centers. Players will generate a small amount of money (c-bills) throughout the game. They can also earn money by destroying enemy units, including neutral AI units in the maze areas. Naturally, destroying enemy player Mechs will earn the most money. At the start of the game each player will have a relatively small selection of Light Mechs to choose from, each embodying a specific style of play. These Mechs can be traded in for different Mechs throughout the game, as long as the player has enough c-bills. Players will also be able to purchase equipment for their Mechs. This equipment will range from additional or improved weapons, things like jumpjets, MASC, Beagle Active Probes, ECM Suites, Coolant Flush systems, etc, and will provide both passive bonuses and active abilities. Equipment will not carry over from one Mech to another, and all Equipment will be "lost" when a Mech is sold. The amount of Equipment a Mech can hold will be limited by Mechs' Critical Space and Weight Limit. See below! Every Mech will have a set amount of Critical Space as well as a Weight Limit that will be used to determine how much equipment you can stuff onto it. As a rule, bigger Mechs have more space and weight available. These are unlocked by XP levels and will normally be passive enhancements to various stats. Unlike equipment, they are tied to the player themselves and so will pass on to any Mech the player owns. Players will have to be careful not to "waste" perks by upgrading to Mechs that can not take advantage of a previously-unlocked Perk. This will remain but be far more tied in to Mech abilities and equipment; every action a Mech takes will produce more heat. Experimenting with having the ability to upgrade the turrets sounds interesting. Like perhaps the ability to replace a turret with a Repair Bay, or a Vehicle Depot to increase the number of AI units that spawn in that lane, or a super-tough garrison bunker that will barf out little Power Armor infantry for additional defense. These would probably be purchased by players using their own personal money, or may be some sort of Team-based upgrade ability. Here is a list of some types of equipment that could be purchased for Mechs. Many of these will be carryovers from normal MCL, others will be new, others will be similar to MCL but function differently. Beagle Active Probe: Time-limited sensor (LOS) range increase, but also makes your Mech visible map-wide. Guardian ECM Suite: Time-limited ability to shroud all friendly units around you to stop them being seen by enemy sensors. Angel ECM Suite: Has same functionality as Guardian, but in addition has a targeted ability to blind enemy units, greatly reducing their LOS. Narc Beacon: If it hits a target, target becomes visible for an extended length of time even if it moves out of LOS. TAG Laser: Target takes additional damage from LRMs. Artemis Guidance System: Greatly increases LRM range and makes Arrow IV missiles guided. Streak Guidance System: Greatly increases SRM accuracy. Thunder LRM Warheads: Replaces standard LRMs with a variant that leaves small cluster mines where they hit, that last for a duration of time and slow anything that triggers them. Inferno Warheads: Upgrade for LRMs and SRMs that makes them apply heat damage to targets, but reduced physical damage. Coolant Flush: A one-time ability that flushes a Mech's coolant and returns its heat levels to 0. Anti-Missile System (AMS): Reduces damage taken from guided missiles. Advanced Tactical Missile System (ATM): Replaces LRMs with a missile system that does slightly increased damage, better accuracy but a flat trajectory (they won't be able to crest over intervening terrain nearly as much). Anti-Infantry Pod: Activates explosive sub-munition pods that will greatly harm nearby infantry around the Mech but do little to no damage to anything armoured. Deployable Sensor Pod: Drops a temporary LOS beacon. Mobile Sensor Drone: Like the Sensor Pod but it can be deployed further. Endosteel Skeleton: Increases the amount of equipment that can be taken on a Mech. Ferro-Fibrous Armor: Greatly increases HP of a Mech but reduces amount of equipment it can have? Double Heatsinks: Increases heat cooldown rate but reduces total heat capacity. Do you need a map spiked ? I totally like the idea. The other moba games for a big part rely for a big part on support units. In your case, it could be upgrades/abilities that increase the stats (reload time, speed, armour, regeneration, cooling) for your team mates. This might not be considered as "true" mech warrior style but will add to teamplay and the game's dynamics. Looks interesting! Best of luck. smoth wrote: Do you need a map spiked ? azaremoth wrote: I totally like the idea. The other moba games for a big part rely for a big part on support units. In your case, it could be upgrades/abilities that increase the stats (reload time, speed, armour, regeneration, cooling) for your team mates. This might not be considered as "true" mech warrior style but will add to teamplay and the game's dynamics. I'm a big fan of discarding "canon" and "realism" for game mechanics. But I'm also a big fan of trying out new things and trying not to conform to much to total ripoffs. There will be types of support; ECM jamming, TAG, Narc, etc.. I don't know if there will be much room for any healing ability. SpikedHelmet wrote: I don't know if there will be much room for any healing ability. How about neutral repair bays in jungle around the upper right and loser left corners oft the map. These would be tactically important spots. Or: remember the US repair drones Form C&C Generals? I totally like the idea of upgrading turrets. This should add a lot to game dynamics. Do you think something like "backdoor" protection should be implemented to avoid players walking right into your base without destroying the peripheral towers? That might also be solved by stronger base towers oft course... I am just brainstorming here. It might be too early for that kind of granularity though. I've played the Wesnoth take on DOTA called "defense of the goblin". There's a significant difference between Warcraft3/DOTA/DOTA2 engine in that it is possible to do arbitrary terrain modifications in Wesnoth; and DOTG used that extensively. Could be cool to have some of that in Spring, if not as terrain then as unit walls, etc. You could make this really fast in Scenario Editor if you wanted to btw. I was thinking that could be a cool angle... have a owned but not directly controlled unit like the Courier in other MOBA that could be called to your Hero Mech to repair and change coolant or whatever... this unit would be killable so you would only use it when you were safe and you'd always run the risk of it getting sniped by insurgents... maybe make it so that you have to stop moving for it to work. This sounds awesome. Lookign forward to its progress. What needs help if any? Any updates on this? Do you guy need a hand with anything? Upgrade units with individual parts … sounds very interesting. The same code could be re-used for modular units like in the Earth2150/60 games. Or for morphing units to T1.5 (2x damage, 2x hp and ~1.2x range) like in TA. The upgrades grant abilities but don't change visuals. If you want modular units, check out ships in latest S44. Lynxx wrote: Any recent advances? Nota and Zero-k allready have mobas..
Lynxx wrote: Any news on this? Hi. We've been in a lull for sure, but we have been chatting about it on Steam and hope to do some more work soon. Zveroboy has had some internet issues which hasn't helped matters, and I've been super busy at work with the start of a new school year. not to get off topic but since when did NOTA havea moba? And since that term seems to be thrown around alot what are you defining as a "moba"?